Digoxin is extracted from the foxglove plant, Digitalis lanata. 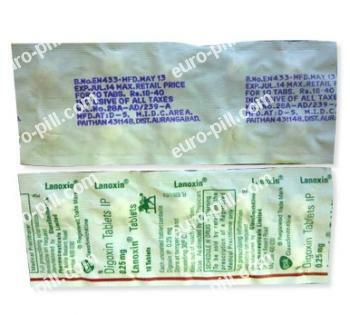 This medication is used to treat various heart conditions (atrial fibrillation, atrial flutter, heart failure). Take Lanoxin by mouth with a glass of water. The best way is to take this medicine on an empty stomach (at least 1 hour before, or 2 hours after meals). Before using Lanoxin tell your doctor or chemist if you are allergic to it; or if you have other allergies. Inform your doctor or chemist if you have certain heart rhythm disorders, heart disease or recent heart attack, kidney or liver disease. Also tell your doctor if you are pregnant or breastfeed. Lanoxin should not be used by patients having demonstrated a reaction of hypersensitivity to this medicine. Lanoxin can interact with Beta-blockers, agents used to treat cancer, diet pills, tetracycline antibiotics, etc.